I received paint complimentary from PPG Architectural Coatings to complete this project. All opinions are 100% my own. This past weekend I had the opportunity to makeover a room with my Mom. Given this opportunity when I still lived at home I probably would have rolled my eyes. 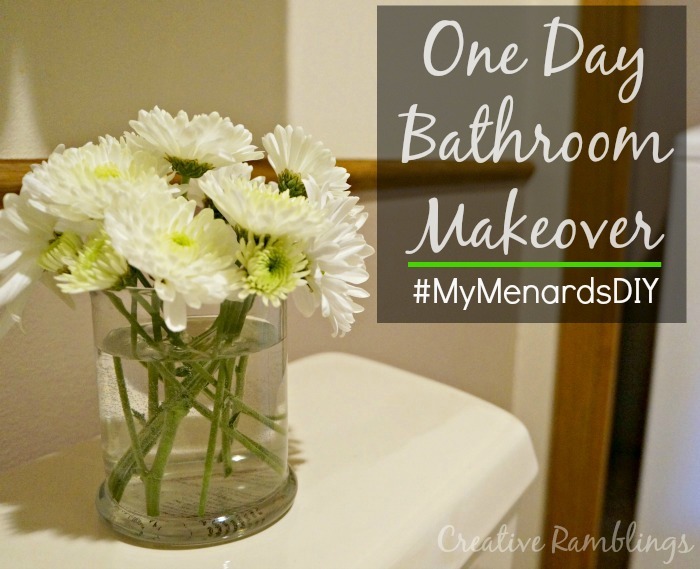 Now that I am older, and clearly wiser, I jumped at the chance to DIY it up with Mom and do a one day bathroom makeover. My parents bought a brand new house in 1989 and I did most of my growing up there. Fast forward 25 years and the house needs some updating. They just got new flooring throughout the whole house and it looks amazing. A kitchen remodel is planned for 2015 and they have done a fantastic job updating the exterior. The half bath/laundry room was looking a little outdated so Mom and I decided to spruce it up with a little paint and new accessories. Something we could do in a day that would have a big impact. So much inspiration. 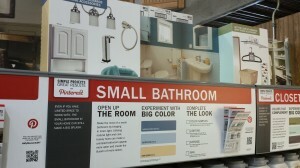 We both grabbed a couple of project cards which give paint color suggestions and accessory options available at Menards. We loved the half wall on the hallway card with a dark neutral on the bottom and a light color on top. 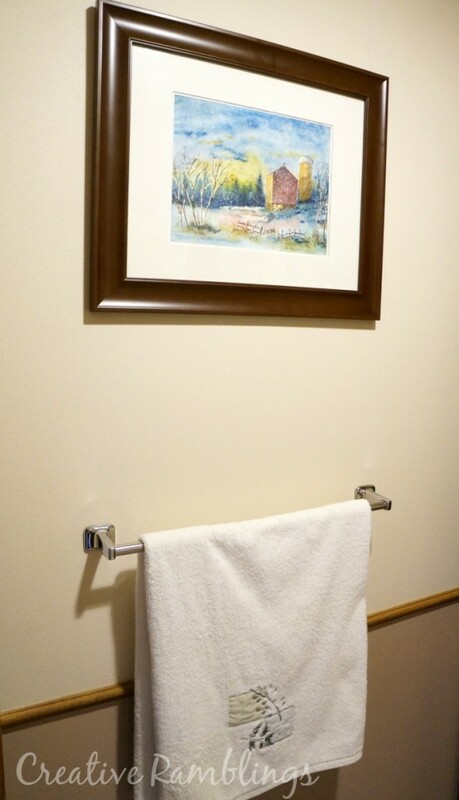 Mom has a chair rail in the bathroom that we chose not to remove. 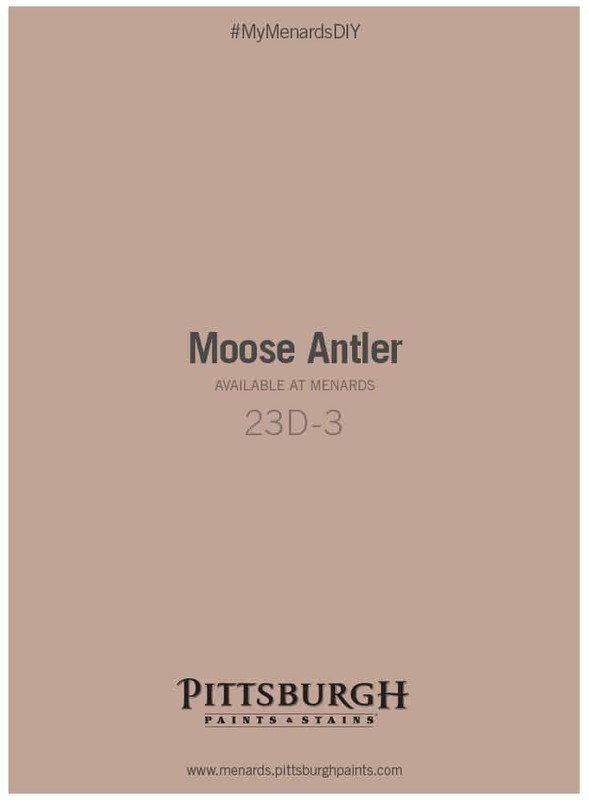 We settled on Moose Antler for the color and chose to paint over the blue sponge paint below the chair rail and inside the laundry closet. Before leaving Menards I picked up a couple of baskets to organize the laundry supplies and new soap. Everything else used in the bathroom my Mom already had. It’s amazing what you can do with a few re purposed pieces. 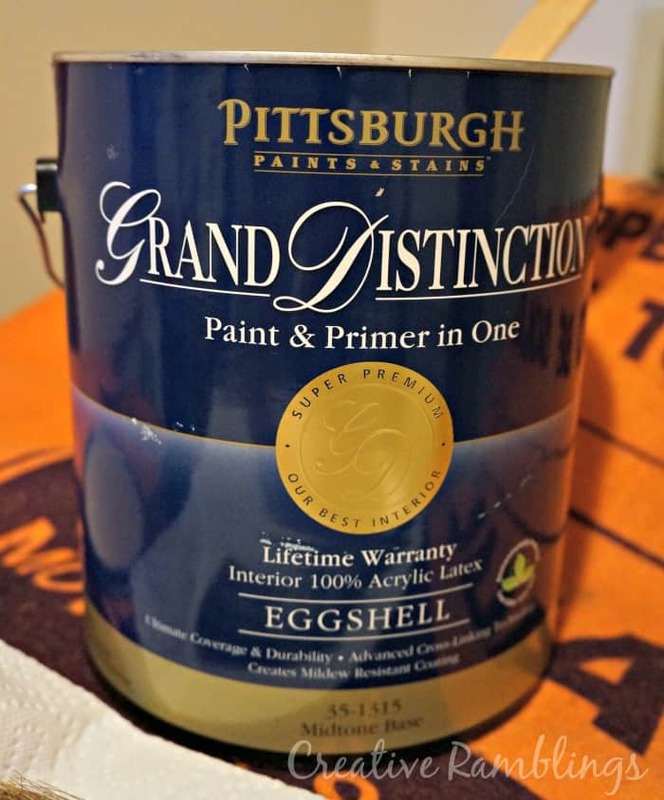 Pittsburg Paint Grand Distinction Paint and Primer in One covered the area in one coat. It gave a nice smooth finish and went on easily. This paint is stain and scrub resistant so it’s perfect for a high traffic room like this. You can learn more about Grand Distinction paint and play around with colors here. There is a color visualizer that allows you to upload your own room photo and digitally paint with over 2000 colors. A great way to plan for a room makeover. 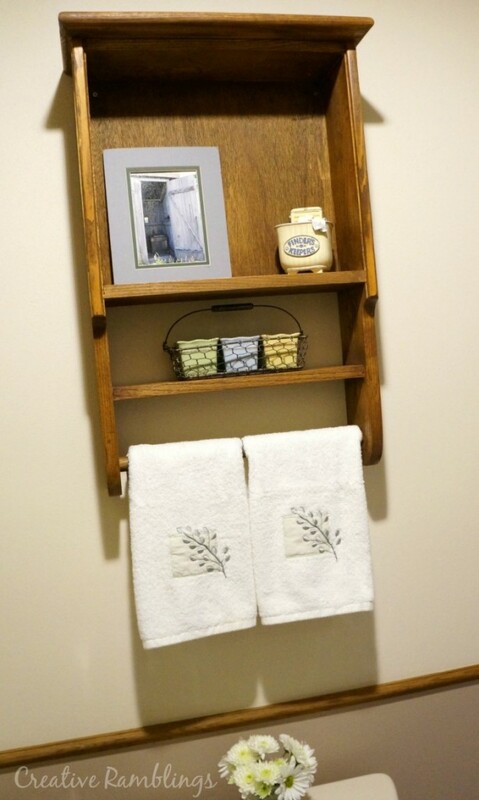 In the laundry closet we chose to leave the wood shelf but paint the metal brackets. The result is a much softer, non industrial feel. On both the wood shelf and the chair rail we used some lemon oil to clean and brighten the wood. It’s amazing what a little shine can do, no need to re stain anything. Once the paint dried it was time to accessorize. We organized the laundry supplies into the baskets. It was a good opportunity to weed out the items no longer in use. Mom pulled out some towels from her main bathroom and I picked up a few pretty pieces from elsewhere in the house to give this room a new look. My favorite update (other than the paint) is the new picture on the wall. This is a beautiful piece my parents bought at an art show a few years back and had yet to hang. The colors are gorgeous and it fits perfectly in the room. We are so happy with the result. I heard my Mom say a couple of times ‘I can’t believe this is my bathroom’. Who knows we may be doing the other bathroom sometime soon! Do you have a room that needs an update? The value of the supplies we bought was under $100 and it took just one day to complete. 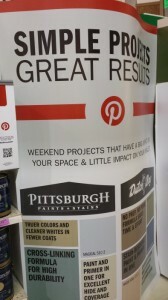 Take a trip to Menards and check out the Simple Projects Great Results display. Pick up some project cards and paint samples to get inspired. Paint a wall. A new color instantly freshens up a room. Clean your wood, walls, floors, baseboards, and doors. It makes a huge difference! A makeover does not have to be extreme. Start with something small and manageable and at the end of the day you will still have time to relax and enjoy your accomplishment. Tell me about your favorite room makeover? What a cute redo!! Good job for one day! Cute! Goodbye blue sponge paint! I love the paint colors you choose. Everything compliments each other so nicely. Great transformation ladies! Oh wow! Love the color, it does wonders just adding a new coat of paint and some updating. You and your mom did a great job! I have never heard of Menards before, what kind of store is it? 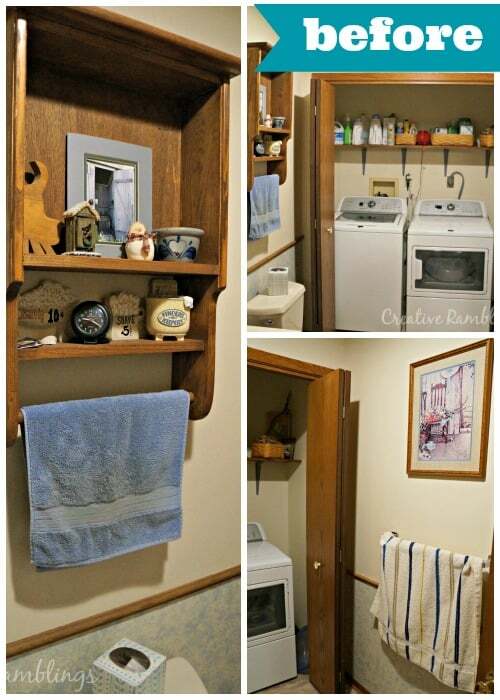 Love the bathroom make over and the baskets look great. I think you just inspired me to do a make over before I have guest over for Christmas! Thank you for sharing! Great job! I’ve never been to Menards, but will check out what Home Depot has. I will share this with my MIL. 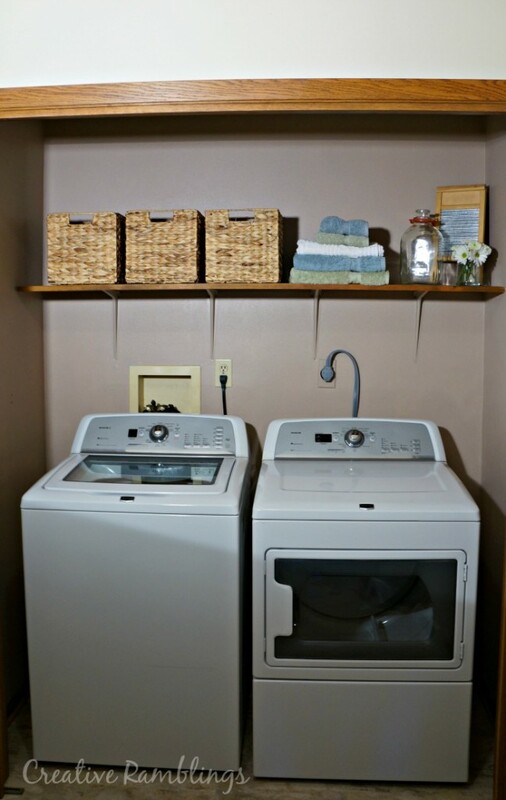 She is in search of ideas on what to do with her bathroom and laundry room. Thanks! Oh wonderful, have fun and thanks for stopping by. 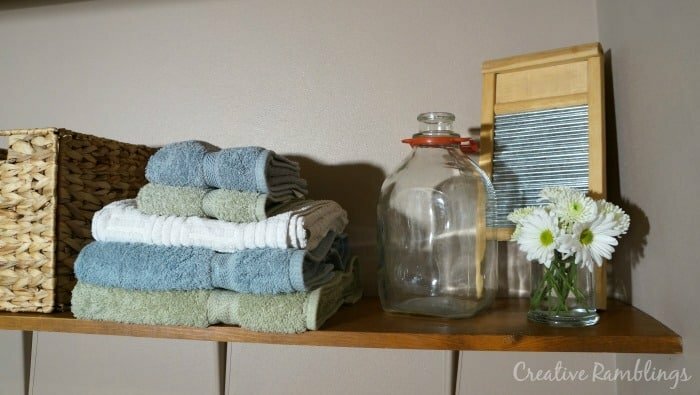 Great way to give an update and more organized feel to a space that you use so much! Thank you Gina, I agree! My husband is stuck in the 70’s when panelling was popular now I’m sick of it & want to paint it. He says no that it’ll look ugly. I’ve done it before at my previous house & it came out fine. I bet it would look good! 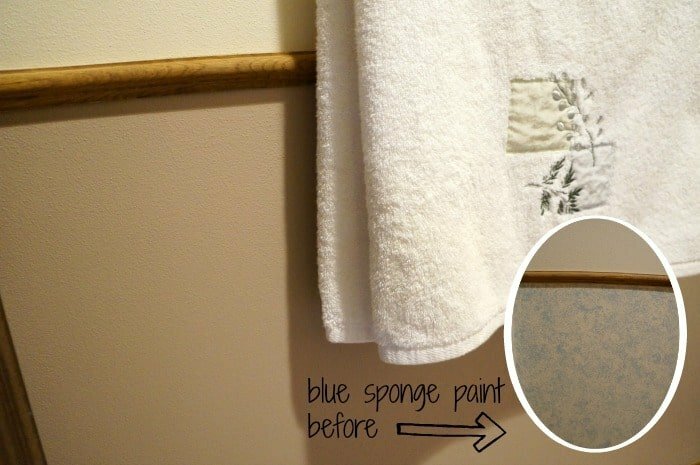 There is some awesome inspiration for painted paneling on Pinterest, show him how great it could look. Best of luck. I really like your choice of paint colour. Looks great!